Today's Nice Price or Crack Pipe 240SX may be that marque's most nondescript body style, however what it's packing below the bonnet is anything but. The question is, will its price prove contrastingly ostentatious? We all have to go sometime, and if it's the last car ride you get to take, going in yesterday's stately 1985 Eureka Concours Hearse wouldn't be a bad way to go about doing it. And, according to 87% of you, that Caddy hearse came with a Nice Price, so buying it preparation wouldn't be the death of you. Heck, for its low asking price you could buy two and have his and hearse! You know what once was dead, but now seems to be rising, Phoenix-like, out of the tire smoke? Compact Japanese rear drivers, that's what. Toyota's got a new one - and Subaru has its own version that's even better. Nissan used to have a couple of them too- the ZX keeping the aviator sunglasses crowd in car payments, and the SX serving those of more modest ambitions. There's nothing modest about what's under the hood of this '95 240SX as it has gone down in displacement from what the factory provided, but way up in power owing to its JDM SR20DET RedTop. When it comes to the SX's lineage, the S14 edition was probably the most undistinguished in appearance. With its introduction in '95, Nissan dropped the hatchback and convertible models focusing instead on a single and somewhat bland-looking notch-back coupe - one that couldn't even boast to having pop-up headlights. This one, in two-tone black over silver with stripy-stripe accents, tries to liven that up. When you consider however, that the car's basic shape acts as kind of an invisibility cloak when it comes to wanton acts of testosterone, its outward modesty should be appreciated. That body's in pretty good shape with only some cheesing on the back bumper cap and a little curb rash on the airdam in front. The car's been dropped and rides on a set of smoked Sport Max XXR 962s. It also suffers from fartcanicus giganticus, but really, with a modded Japanese coupe, what did you expect? On the inside, the first thing you might notice is how nice the interior is for a Nissan. Long leading the parade for tiny buttons and dashboards that rival jigsaw puzzles in complexity, Nissan did it right with the S14. This one - in goes-with-everything grey - is appreciably clean with the notable exception of the driver's floor pad which is a little grungy, and the steering wheel center which looks like it's suffered a karate chop. Weird. It's the JDM mill under the hood that makes this 240SX special though. The DOHC RedTop came in the home market Silvia, so it and this car likely needed little introduction. Along with being big in Japan, this one has also been made GReddy Set Go! with that company's intake, intercooler and Mitsu T05 turbo to liven things up. Power? Well, factory the engine put out a little more than 200 ponies so this one's probably even more-more. Along with the replaced engine comes a new gas tank and a whole bunch of billet and bolt-ons under-hood and on the suspension. Getting this California-tagged custom to pass smog must be fun, but as they say, where there's a will to pay there's a way to play. Comparing this car's specs to that of a contemporary BMW M3 really casts the Nissan in a good light. The power is there, and while the S14's suspension isn't as complex or competent, it's probably going to prove more durable. Not in the range of the typical E36 M3 is this 240SX's price, which is a requested $8,500. That's a lot for an old SX, but is it too much for an SR20DET-equipped example? What do you think, is this S14 worth that kind of cash? 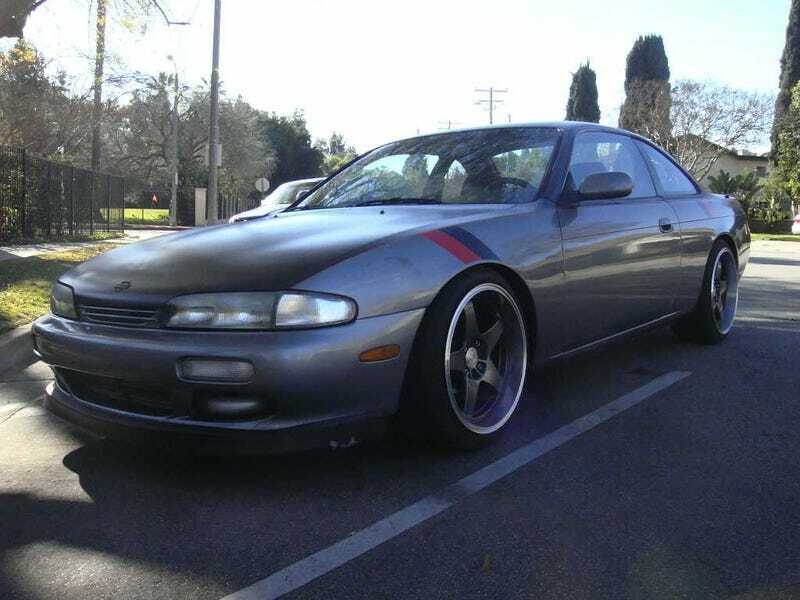 Or, is this a 240SX with a price that's SX-ive?